DES MOINES - President Donald Trump may not be a fan of wind turbines, suggesting that the noise they produce may cause cancer, but Iowa's Republican senators are big fans of wind energy. Sen. Chuck Grassley called Trump's cancer claim "idiotic." On Thursday, Sen. Joni Ernst called the statement "ridiculous." "I would say it's ridiculous. It's ridiculous," Ernst said, according to WHO-TV. She likened the claim that wind turbine noise causes cancer to the idea that church bells do the same. "I have church bells that ring all the time across from my office here in D.C. and I know that noise doesn't give me cancer, otherwise I'd have 'church bell cancer,'" Ernst said, adding that she is "thrilled" to have wind energy generation in Iowa. "I don't know what the president is drawing from." Trump has a history of degrading wind energy and wind turbines that dates back long before his Tuesday claim that turbines harm property values and cause cancer. Not only are wind farms disgusting looking, but even worse they are bad for people's health. "Not only are wind farms disgusting looking, but even worse, they are bad for people's health," Trump tweeted back in 2012. "It just seems like every time you turn around there's another thing the president is saying -- wind power causes cancer, I associate myself with the remarks of Chairman Grassley -- it's an 'idiotic' statement," Pelosi said in her weekly news conference on Thursday. The president made his latest claim about wind turbines in a speech on Tuesday at a Republican spring dinner. 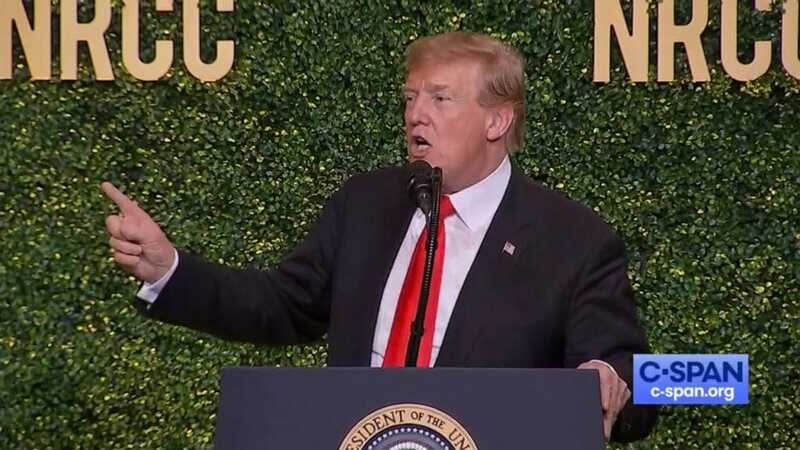 "If you have a windmill anywhere near your house, congratulations, your house just went down 75 percent in value -- and they say the noise causes cancer," Trump said Tuesday, swinging his arm in a circle and making a cranking sound to imitate the noise of windmill blades. "And of course it's like a graveyard for birds. If you love birds, you never want to walk under a windmill. It’s a sad, sad sight." Wind turbines are not, in fact, proven to have widespread negative impacts on property values, according to the Department of Energy's Office of Scientific and Technical Information in the largest study done so far in the U.S., and there is no peer-reviewed data to back up the claim that the noise causes cancer. I am considered a world-class expert in tourism. When you say, 'Where is the expert and where is the evidence?' I say: I am the evidence. It's true wildlife is affected by wind turbines -- particularly birds and bats. One study estimated between 140,000 and 328,000 birds are killed annually by collisions with turbines across the U.S. The U.S. Energy Information Administration estimated, however, that other human-related impacts also contribute to declines in population. The wind industry works with biologists to find solutions to the impact of turbines on wildlife, and the Department of Energy awards grants each year to researchers addressing the issue. But, overall, scientists warn that climate change itself is a bigger threat to bird populations than wind turbines, according to the National Audobon Society. Speaker Nancy Pelosi: "It just seems like every time you turn around, there's another thing. The president is saying wind power causes cancer. I associate myself with the remarks of Chairman Grassley; It's an 'idiotic' statement"